Re: Did you know-you can make member names clickable on your swap list! That's one of my favorite tricks! I love the clickable names! 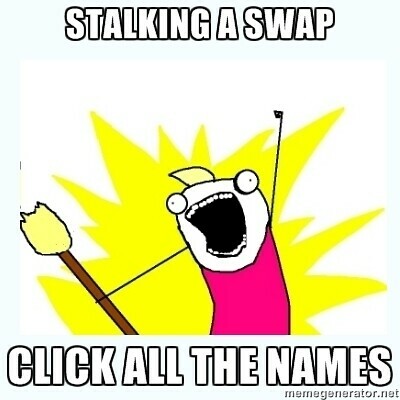 Makes stalking and checking a lot easier, especially if you are not familiar with the swapper! Thanks for the instructions for techno-challenged peeps like me! Woohoo, go Smmarrt, go, go, go!!! Re: Did you know-secret partner swap lists should be sent to the swap mods! If your swap is a "secret swap" where people won't know who they're getting their item from, you must let one of the Swap Moderators know who is matched up with whom. This is to guarantee that should you need to step away from Craftster during the swap, a swap mod can take over the swap and assure that everyone sends and receives. The best way to send your partner list to the Swap Mods is via the Help Desk. Open a ticket (making sure you choose the Swap Related option) and put all the relevant info in it-Name of the Swap, a link and of course the partner list. Re: Did you know-you can post your swap items in the appropriate board! Did You Know - swap items you have made can be posted in the appropriate board once your partner has received! There are a ton of amazing crafted items made for swaps that often are only seen within the swap gallery thread itself. Please feel free to post any swap item you have made for a partner in the appropriate board once they have received (don't want to spoil the surprise!) and let everyone else see what you have created! We love to see your projects! Re: Did you know-you can post swap items you've made in the appropriate board! YES! Not all members cruise the galleries, and even those who do, probably don't see every single gallery. If it's awesome, post it! Talk about it! Tell us how you made it! We wanna see! Quick links to important Swap pages and extra information.